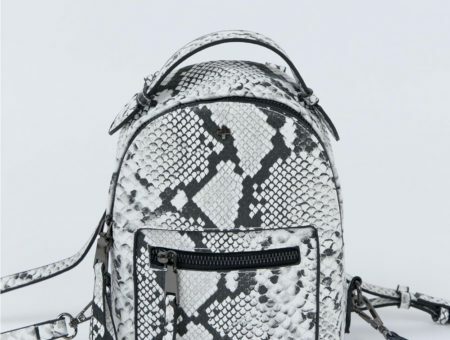 Back-to-school is in full swing across the country, bringing fresh trends for the school year! I have noticed many girls on campus sporting rompers lately. These rompers often feature interesting prints, are made of fun fabrics, and/or have cute unique details. Rompers are a great item for college girls because they are basically an entire outfit in one piece! They’re also very comfortable. Interesting prints make a bold statement on their own! This is a great alternative to a dress, while still achieving the same one-piece look. 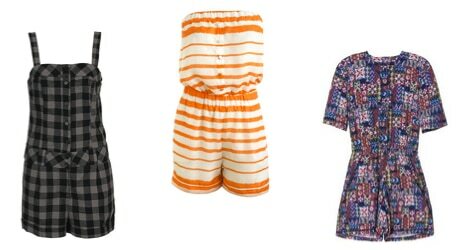 This season, rompers are available in a wide variety of prints. Everything from plaid, to floral, to abstract is available out there and can be a reflection of your personal taste! If comfort is your concern, paying attention to the fabric is key. Fabrics that reflect light, such as satin or silk, will give you a soft, lingerie feel. Cotton rompers are also notable for their soft feel. If you desire an modern, comfortable twist on the overall, try a denim romper (center photo above). Playing around with fabrics can be fun! Unique details can be a great way to show self-expression! This can be in the form of a girly ruffle (left photo), quirky pockets (center photo), or a printed, artsy belt (right photos). You can even think of these details as a built-in accessory! Use minimal accessories to complete the outfit. I like long necklaces with a charm on the bottom, a cuff bracelet, or a headband. Complement your romper with basics that you already own! Rompers go great with solid colored cardigans and blazers. Rompers can be paired with a variety of footwear. 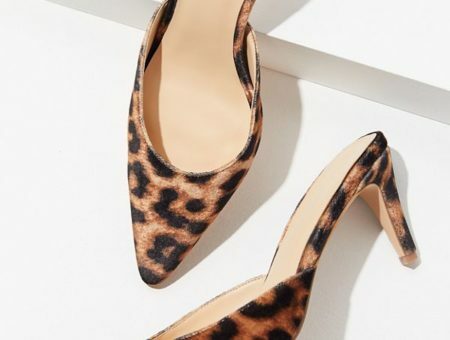 For warmer weather, a pair of strappy sandals or ballet flats works well, whereas in cooler weather, ankle, midcalf, and even cowboy boots look super chic and will keep your toes warm. Add your own pizazz or personal flare to a romper – be daring with a bight, chunky necklace, or even tights! Be comfortable! 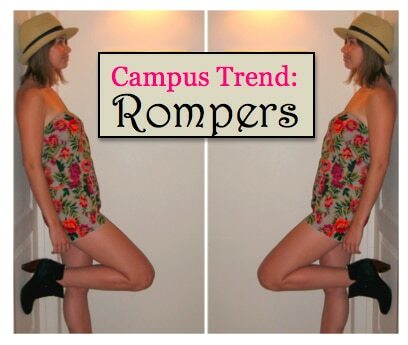 Especially for college student on-the-go, a romper can be a great way to throw together a cute, cozy outfit. Get the most use out of your romper by wearing it for day and night. Check out the outfit examples below! What do you think about this trend? Do you like the romper look? Do you have any preferences in regards to the print, fabric, or detailing? Leave comments with your opinions! Previous Would You Wear… Designer Bunny Ears? Next Would You Wear… Ankle Socks and Heels?